The Encounter Display is the primary physician tool for patient rounding and for charting patient observations outside of the Physicians Practice setting. The Encounter Display shows all salient information for the patient, including problem list, medications, and recent lab results, and offers a large field of unlimited length to chart a patient observation. Charting a note is supported by an extensive user defined Phrase Catalogue which allows the user to select predefined phrases in order to compile a larger note. The Phrase Catalogue improves charting consistency and completeness, and greatly accelerates note composition. A note may be associated with one or more patient problems, which will allow the user to track the events/progress pertaining specifically to any individual patient issue. 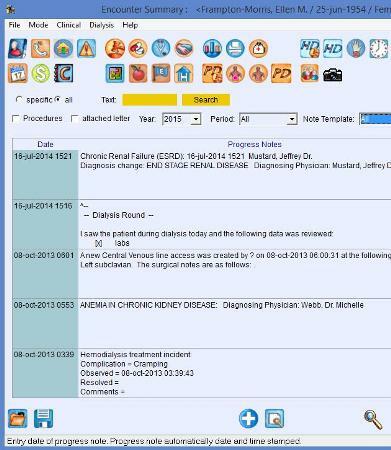 The user has access to all ordering functions as well as many other chart sections directly from the patient encounter display, upon which the note is written. This provides one central display, i.e. "one stop shopping" at the Encounter Display. Medication orders can be modified), laboratory results trended, new problems charted and diagnosed etc. A procedure may be charted, indicating a patient visit of a standard complexity level, or charting another procedure selected from cyberREN's CPT-4 catalogue. Procedure information is captured for billing purposes, to be forwarded to a financial system for further processing and invoicing.